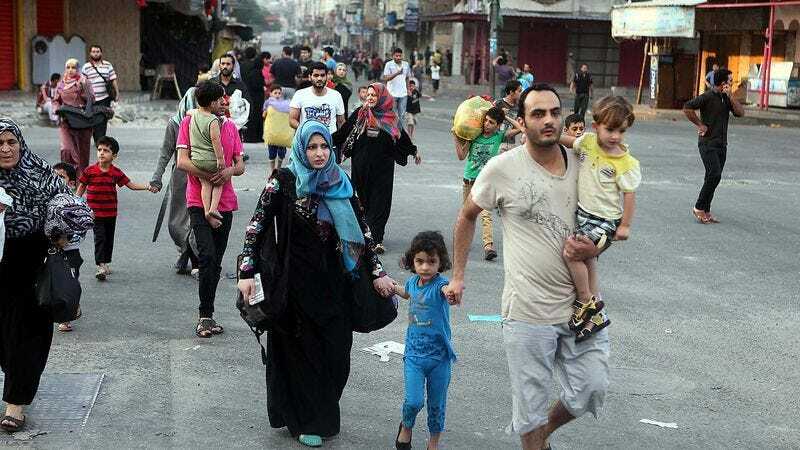 JERUSALEM—In response to criticism surrounding the death toll during its ongoing incursion into Gaza, representatives from the Israeli government Wednesday emphasized that warnings sent to Palestinian civilians provided them with ample time to evacuate to nearby bombing sites. “We are being very careful and thorough as we carry out our targeted strikes, and I can say, without question, that Palestinians are given more than enough time to leave their residences and find shelter in a future bombardment target,” said Israeli Defense Minister Moshe Ya’alon, adding that whether alerted by phone, text message, or leaflet, Palestinians have sufficient opportunity to relocate to any number of locations marked for imminent aerial strikes. “Giving Palestinian civilians the chance to seek safety in the home of a family member or friend that will be shelled to rubble in the next 48 hours is a gesture we deserve praise for, not condemnation. In fact, this initiative has been a major success in this campaign.” Ya’alon added that since there were numerous bombing sites Palestinians could take shelter in, he was not responsible for whatever happened to people who chose to stay home.